Raindrop Technique is designed to bring balance to the body using nine essential oils applied to the shoulders, feet, and back. This highly relaxing massage session is given to the client while laying face down as the essential oils are dripped on the spine (diluted in a carrier oil) and then gently massaged into the back. After the essential oils have been applied, a towel soaked in hot water is applied to the back to drive the oils further into the body. Gentle traction is applied to the feet and neck at the end of a session. 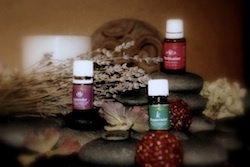 Michele Cunningham's knowledge of Aromatherapy lead her to dilute essential oils in a carrier oil. Her education at Finger Lakes School of Massage as well as self study show that a combination of too much of an oil as well as oils applied directly to the skin have potential risks to the client and to the therapist. In addition, the Alliance of International Aromatherapists (AIA) and the National Association of Holistic Aromatherapy (NAHA) do not support the use of undiluted essential oils. These essential oils have a wonderful therapeutic value in a dosage that is in line with the AIA and NAHA's recommendations.